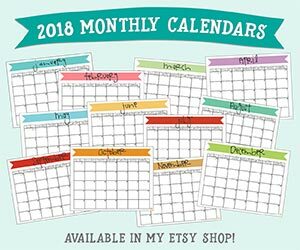 i have an almost 3-year-old who, while he used to be a great eater when he was a year old, has refused to eat anything other than sugar and chocolate for a long time. obviously, i don’t give him those things all the time and he eventually breaks down and will eat a cracker. not exactly the nutrition i want him to be getting! 1. normally, he would look at his food and say “i don’t like it” no matter what it was and even if he’d never tried it before. so we made up a rule: you have to take 1 bite and THEN you can say “yes, i like it,” or “no, i don’t like it.” but you have to have 1 bite. this has worked out pretty well because 9 times out of 10, he’ll say it’s really good and wants more! 2. involve him in making the food. this one is tough for ME because, let’s face it, sometimes cooking with kids takes a ton more time, mess, and effort than is necessary. but, it’s good for his development and if it helps him to want to eat his food, then i’ve just gotta do it! even if it’s just a matter of letting him stir something, or pour the measured ingredient into the bowl. if he participates he feels more like it’s his creation rather than something mom made and is forcing him to eat. 3. for lunchtime, i give him the options of the things he can eat and then i let him choose what he wants. he’s in the independent stage right now, so it’s important for him to feel like he’s in charge of what he eats and this helps him to actually eat it! 5. i’ve started using a variety of shapes in my food preparation. 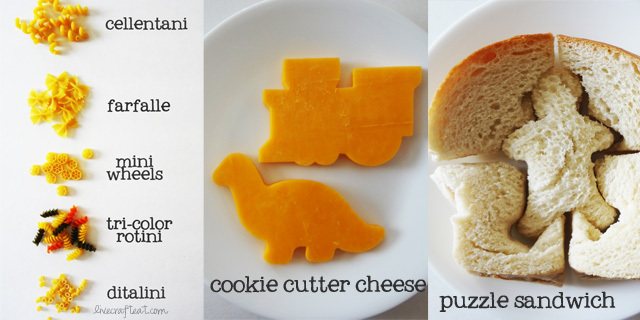 everything from using cookie cutters to cut cheese into trains or his sandwich into a fish-shaped puzzle, to using many different varieties of pasta – it’s all worked out! spaghetti noodles aren’t the only type of pasta out there 😉 just the other day we used “mini wheels” and told him they were just like train wheels. he played with his food, yes, but he also ate it! we’ve also used farfalle, tri-color rotini, cellentani, ditalini…they’ve all been so fun! by the way, one of his favorite things to eat now is pasta with some melted butter and parmesan cheese. 6. we try using plates, cups, and utensils in his favorite color or cartoon characters. we also try using sectioned plates, or plates in the shapes of animals, etc. muffin tins have also worked very well. he seems to like the variety, and that there’s something fun for him to eat with/off of. 7. i usually serve his food with some kind of dip: ketchup is an obvious one, but i’ve also used sour cream to dip quesadillas, yogurt to dip fruit, ranch dressing to dip vegetables, etc. sometimes he’ll just lick off the dip, but most times he’ll take a whole bite of whatever it is he’s dipping and then will continue dipping & eating! 8. i have a lot of my kids’ snacks easily accessible in the pantry – granola bars, crackers, fruit snacks/fruit leather, pretzels, etc – all within his reach. the sugary stuff is always on a high shelf where he can’t reach/see it. out of sight, out of mind! i also keep fruit out on the counter or kitchen table so he can grab an apple, banana, or pear whenever he wants to. again, he can see them, and he knows that he can have them. 9. sometimes if i need to help him eat his food (read: spoon-feed him) because he just doesn’t want to do it himself, i’ll put on his fork something that i know he wouldn’t eat if he were to see it. then i put something he likes on the end of the fork thereby hiding the food he doesn’t like the look of. once it’s in his mouth, he has no idea he’s even eating it! -mini oranges. my kids LOVE these!! they can peel them themselves and they are juicy and sweet. i always have a big bowl of these for them to eat. -mini bell peppers. NOT hot peppers! even though they look like they might be hot peppers, they’re actually just “baby” versions of the regular old bell peppers. we just wash them, and then start eating from the bottom to the top, avoiding the seeds and stem at the very top. -chicken nugget sliders. i know my kids are not the only ones who love chicken nuggets and would eat them all day every day. so to mix it up a little bit, i bought some slider buns and put 2 chicken nuggets inside each one. voila! it’s a “baby” chicken burger. my kids like them just like this, but you could put on whatever toppings you’d typically put on a burger. -mini bagels. he always sees me eating my regular-sized bagel. but it really is too much food for him, and it’s a little too ordinary. but i give him a “baby” bagel, and it’s just the right size for him! -mini pizza. 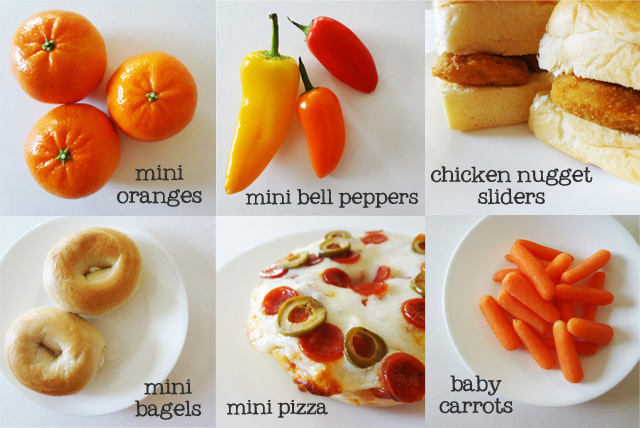 you could make these on mini bagels, regular-sized bagels, or even english muffins or pita bread. plus, they like helping to decorate their own! especially when you use “baby” pepperoni! -baby carrots. these really are just the right size for little hands and bellies. my kids eat these every day! all of these things listed here have worked wonders for us. 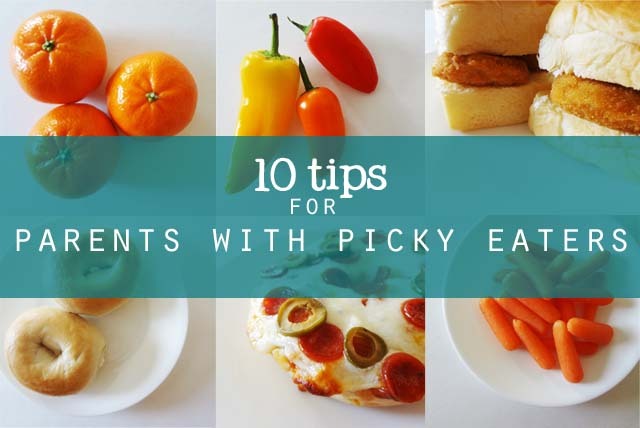 i hope you’ve found at least 1 tip that will help you in your efforts in getting your picky eater to eat better! good luck! Tyson® Chicken Nuggets, who sponsored this post, is giving away a free colorful plate to make mealtime more fun! Now that I’ve shared how I got my picky eaters to eat balanced meals, share your success story for a chance to win a $1,000! This is a sponsored conversation written by me on behalf of Tyson Chicken Nuggets. The opinions and text are all mine. Official Sweepstakes Rules.